For those of you who can’t get enough of the Thanet Congress games here is a bonus. I had intended to draw a line after featuring one game from each of the four sections but David Horton sent me a couple of his games this morning so as we are always keen to promote Broadstairs players here is his win from round four. 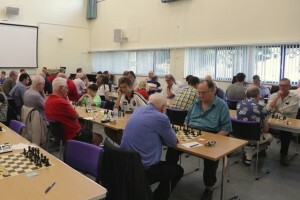 Here is a final game from last weekend’s Thanet Congress. So far we have seen one game from each of the Open, Minor and Intermediate sections so to complete the set here is a game from round two of the Major. If you came to the congress, we hope that you enjoyed it – the organisers certainly received many positive comments. Next year’s event will be at the same time (the weekend before the Bank Holiday) so put it in your diaries now and remember to book your accommodation in plenty of time. Action from the Minor and Intermediate sections of the Thanet Congress. Eagle-eyed local players should be able to spot a few Thanet regulars. You might need the original photograph to identify the four Broadstairs players but good luck! So far we’ve seen one game from the Open and one from the Inter so here is one from the Minor submitted by Alan Brewis, who says he is ‘keen on weaker players sharing games – but they rarely do’, adding that ‘there is more to gain than lose’. I think we would all agree with that whatever our level. IM Andrew Greet was the highest-rated player in the tournament and a worthy winner of the Open with 4½/5. Here is his win from round two. A more detailed account of this game with analysis from Leon Wooldridge can be found by clicking here. 117 players took part in this year’s Thanet Chess Congress which was held as usual at the Canterbury Christ Church University in Broadstairs. There were four sections: Minor (U110), Intermediate (U140), Major (U170) and Open. Congratulations to all the prizewinners, especially to David Faldon and Reg Pidduck from Broadstairs who won the senior prizes in the Open and Minor respectively. Michael Page, formerly of Broadstairs Chess Club, came joint second in the Intermediate section. Many thanks to the Controller, Kevin Thurlow, to Alan Atkinson, whose hard work made the whole thing possible and to John Couzens for his continued sponsorship. A full list of results can be found by clicking here. I intend I publish a few games from the congress over the next couple of weeks so as Patrick Sartain was quickest off the mark, it is only fair that his game against Gavin Josephs in round three should feature first. If anyone else would like to have a game published, please type it out – preferably in algebraic notation – in the ‘contact us’ section of the website and I’ll do my best to include it.